As part of the Top Global Teacher Bloggers / CMRubinWorld.com / Global Search for Education http://www.cmrubinworld.com/TGTB, this is my answer to this month’s question: How are you promoting well-being, health and happiness in your classroom? We as educators need to look at the whole education system. That is the inside of the school and its mechanisms as well as the relationships between the people. We can make small changes with class projects but permanent changes in students’ well-being requires more structural changes. Some think schools are similar around the world, but my experience is that there can be huge differences! Well-being, health and happiness can and must be promoted on many levels in the school. First we should look the school building. In the early 60s and even later school buildings looked like hospitals. They looked like rectangular prisms with long corridors with similar classroom on both sides. Students moved from one class to another, sometimes without any breaks. Today we understand better the importance of environments for learning and also how important the breaks between the lessons are. Good school buildings today have modern architecture, with open areas where students can gather together, work in smaller studying places around the building such as the library. Even in the classrooms one can have different areas for different learning situations. In Finland our new curriculum added extra hours for sports based on education research. If you move around enough you can also concentrate better and learn more easily. Also the breaks between lessons are important. The younger the pupils the more we have focused on activities outside in the schoolyard. It is obvious that every child should be provided with free transportation, free lunch and free books during their studying years. In our curriculum you can read about children’s rights to have these services. Students have the right to get personal support e.g. for learning problems. They can stay in the school nursery during the school day if needed. In every school we have a special professional group of adults: a psychologist, principal, social worker, class teacher and sometimes the youth police. Their jobs are to do preventive work such as running anti-bullying programs. They deal with issues that class administrators are unable to handle. When issues arise with student the parents and the student take part in the meeting. School is for students and today in Finland students can take part in the decision making process. When we were developing the new curriculum parents and students were involved in the school planning. Students have their own group “oppilaskunta”, the frat, which shares ideas and carries out activities that create a good community for all. Students in this group get training from the Finnish Red Cross. Even if all of the above is working well, the student to teacher, teacher to teacher relationships are most important. We are talking about the spirit of the school. That’s about how students and teachers respect each other, build trust and promote student freedom. The principal of the school has a huge role and every single teacher in their classroom in terms of how they support and develop the atmosphere of the school. In the beginning of the 7thschool year, I asked students to draw on paper what their feelings and expectations were for the mathematics lessons. 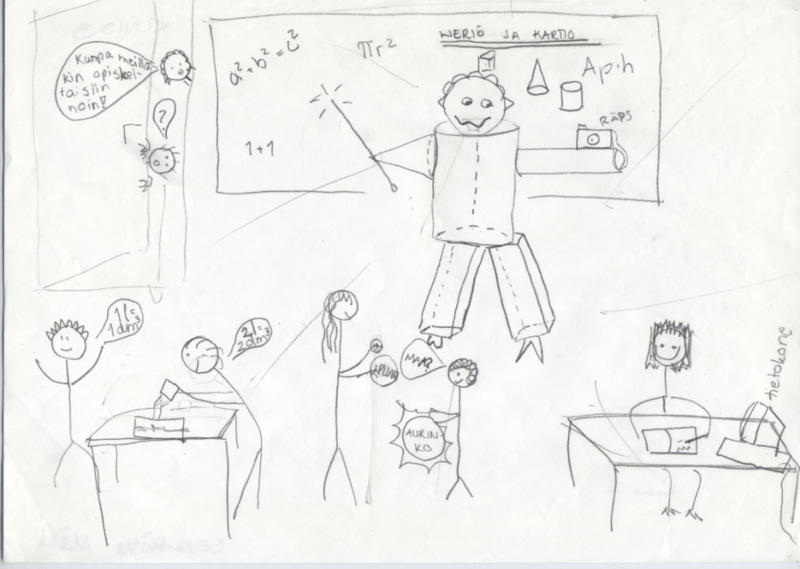 I got pictures in which pupils drew themselves sitting alone by the desk, they were all in rows and the teacher was a big figure in front of the blackboard and teaching. There were also pictures, where pupils used dark colors to illustrate “signs of sweating” and anxiety towards mathematics. Those pictures proved to me that I had to make changes in math content, activities and communication and my methods of teaching. 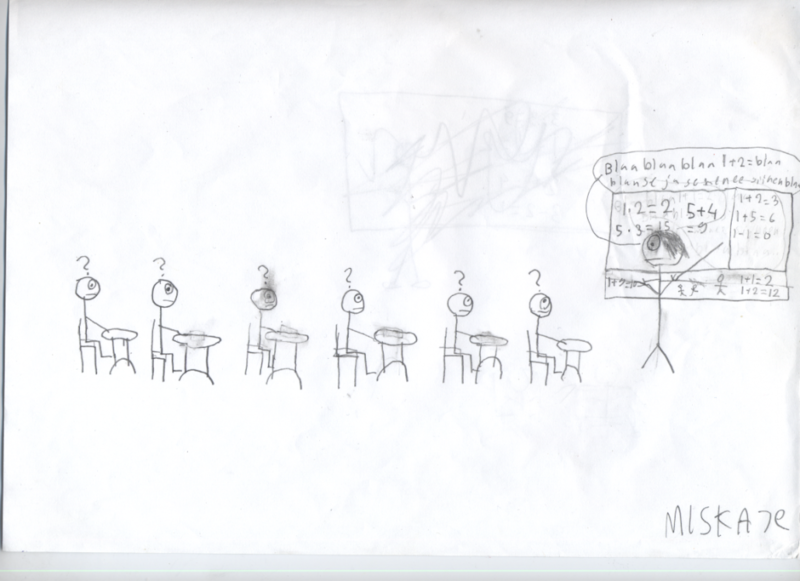 After three years I asked the same students to draw a picture again of a math lesson. In these pictures I could see them working and talking together, smiling and expressing positive comments and including memories from several different learning situations. Being a math teacher I can talk about the importance of how the subject is taught and how important the teacher’s relationship with is with her students. Every teacher should have some knowledge of attachment theory. It is important to be a caring teacher. The mathematics teacher plays a key role in the quality of the student’s relationship with mathematics. I believe that if we pay attention to the importance of our relationships with our students and make Math curriculum more meaningful, we as math teachers could make a huge change in students well-being all over the world. http://marketing.pathstomath.com/wp-content/uploads/2013/04/paths_to_math_logo_340x156.png 0 0 Maarit Rossi http://marketing.pathstomath.com/wp-content/uploads/2013/04/paths_to_math_logo_340x156.png Maarit Rossi2018-02-23 07:01:332018-03-01 13:57:24How Are You Promoting Well-being, Health and Happiness in Your Classrooms?